I created and composed two custom video demo’s for Duesenberg Guitars. I got to play guitar on the score for the movie Love and Shukla. Music by Karl Heortweard. This is a short documentary about the recording of the two One Takers albums for Blinq Music. All the songs were tracked live with the entire band in the live room of the legendary Arnold Muhren Studios in Volendam. I contributed two compositions as well. I played guitar on the score for Elvis Walks Home. Music by Karl Heortweard. A piece of music I wrote is currently being used in the American tv commercial for Vikings: War of Clans, airing on networks like ESPN, Fox Sports, NBC Sports and H2! Here’s a song I co-wrote, produced and played all of the instruments on by Tim Akkerman. I recorded the guitar parts for the score to “Hallo Bungalow”, a Dutch movie that’s in cinemas all over the Netherlands now. The music was composed by Floris Verbeij. Today is the official release of Tim Akkerman’s new single “I’m Still Alive”. I co-wrote the song with Tim, played most of the instruments and also produced and mixed it. You can download in on iTunes or listen to it on Spotify. Yet another collaboration with Moritz Schmittat on the score for the movie The Scopia Effect. I spent two days in Hollands finest studio Wisseloord to record the music for the upcoming Stage Entertainment musical De Tweeling. The music is written by Ilse DeLange and JB Meijers, best known for their work as the Common Linnets. 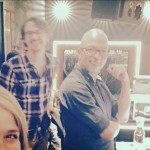 On the picture you see Ilse, drummer Leon Klaase and pianist/musical director Jeroen Sleyfer. Another movie score by London based composer Moritz Schmittat I played and recorded the guitar parts for, this time for the movie A Dark Reflection. The Arabic vocals you can hear in the opening song are done by no one less than Khaled. This is a song I wrote with Channah. I also played all the instruments, produced and mixed it. This is the new single by singer-songwriter Sidewalk. I shared guitar duties with session guitarist Leendert Haaksma on this one, I played most of the electrics, he played the acoustic guitar. Besides my normal rig we also used a tiny portable Vox amp to record the slide part.